At the end of Spring semester, the last exam lets out. Students scatter to all parts of Michigan, the country, and the world. Meanwhile, the professors gather canned goods and bottled water, select their favorite classroom, turn off the lights, and slip under a desk to hibernate for the summer. Wait… can that be right? Welcome back, returning Hope students! 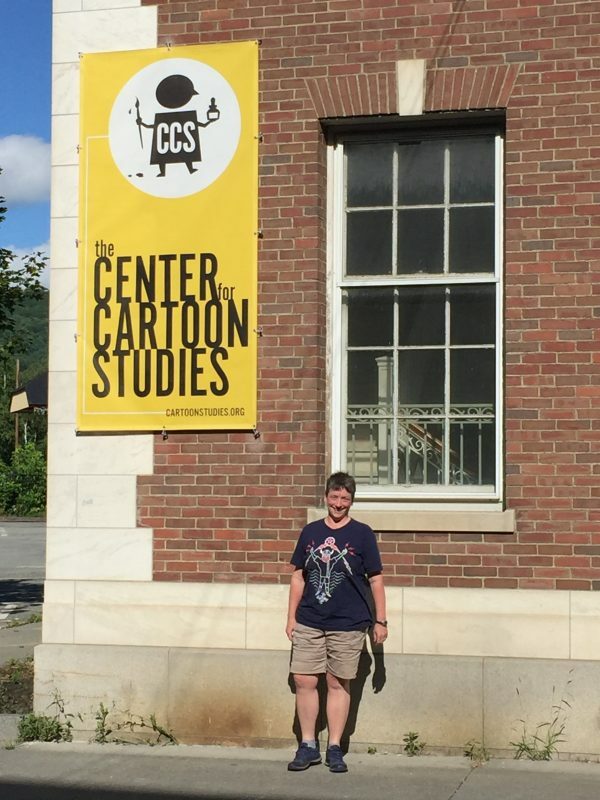 Welcome, first-years! The English department is delighted to see you, and we’d love to hear what you did on your summer vacation — though we promise not to make you to write an essay with that title. Here’s a glimpse into what some of us did with ours! 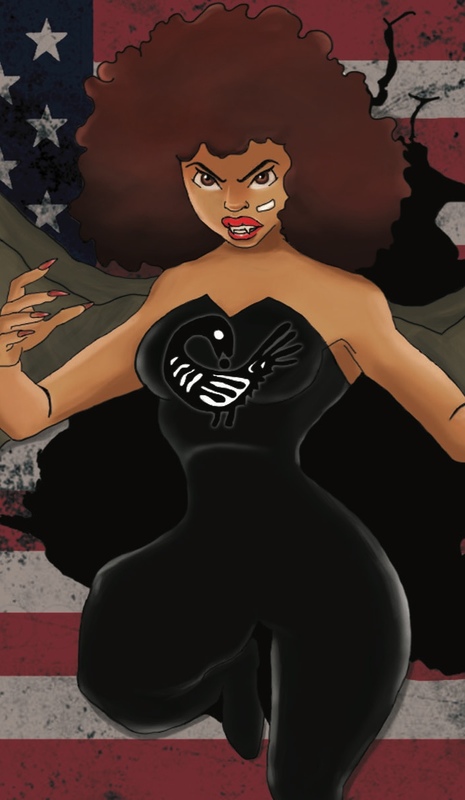 Over the summer, Dr. Kendra Parker completed her manuscript, She Bites Back: Black Female Vampires in African American Women’s Novels, 1977-2011, and the book is expected to be released in December 2018. ← Here’s a partial sneak peek of the book’s cover image. We can’t wait for She Bites Back to come out! Dr. Jesus Montaño and Dr. Regan Postma-Montaño spent the summer finalizing their book manuscript, Tactics of Hope in Latinx Children’s and Young Adult Literature, under contract with University of New Mexico Press. Busy people around here! We’re all very excited to read Tactics of Hope, too. Bill Moreau shared this wonderful photo of him standing with his Education Department June Term group. 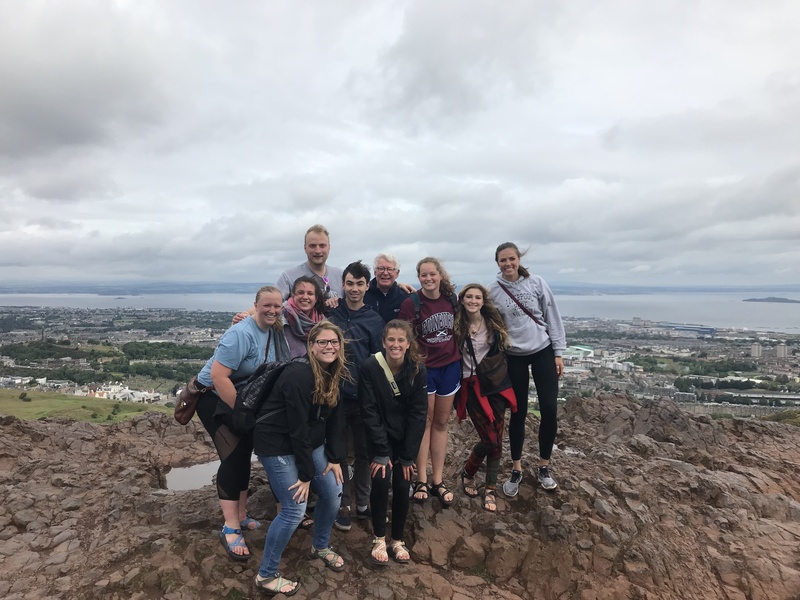 Students took either an elementary school literacy class (taught by Laura Pardo) or a secondary school methods class (taught by Bill), and spent two weeks in classrooms in Liverpool area schools. 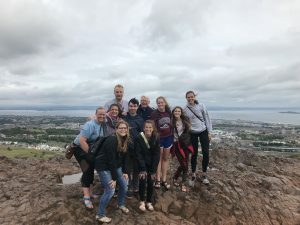 They also got to take fun three-day weekend trips, like this visit to the top of King Arthur’s Seat (an extinct volcano) just outside Edinburgh, Scotland! 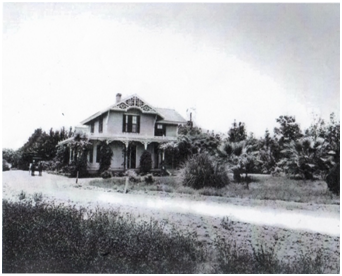 Dr. Elizabeth Trembley had a very full summer. She got to sing Hope’s Alma Mater hymn with the Chapel Choir several times in South Africa! In her words, she had an amazing time “experiencing music and history and the daily work still done in South Africa to further the cause of justice, especially for marginalized groups of people.” She also worked on her graphic memoir, and traveled to Vermont for a workshop on creating book-length comics with Eisner award winner Paul Karasik. 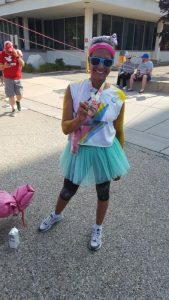 She’ll be on leave of absence this year to work on her book, but plans to stay connected. 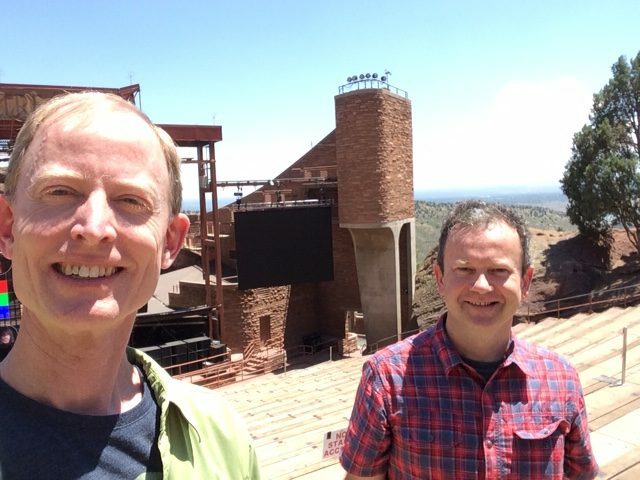 Dr. Curtis Gruenler and Dr. Matthew Packer of Buena Vista University, U2 fans and joint editors of the Bulletin of the Colloquium on Violence and Religion, were thrilled to visit the famous Red Rocks Amphitheater while in Denver for COV&R‘s annual meeting. Prof. Gruenler gave a paper on “Mimesis, Friendship, and Truth,” ideas he’d explored during his spring semester sabbatical. English major Annika Gidley ’19 came along too, and gave a very well-received paper on her summer research project with Prof. Gruenler, about René Girard’s mimetic theory and the Harry Potter series. Another traveling researcher was Dr. Marla Lunderberg, who wrote an article about best practices for including Asian Studies materials in Western Cultural Heritage courses. (She invites everyone to ask her about Zheng He!) Between teaching two summer courses, she gathered with all four kids and their significant others to celebrate her oldest son’s wedding! 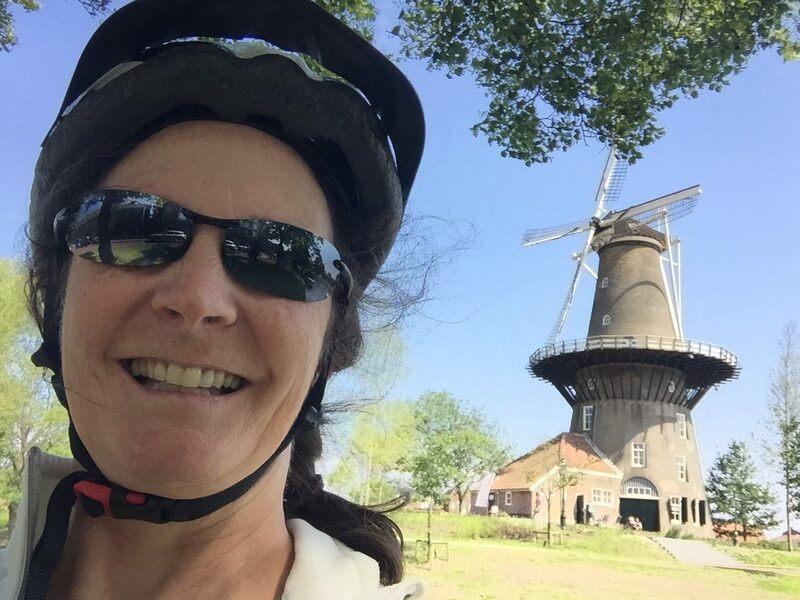 In June, she meandered through Europe, biking in the Netherlands, visiting the Bayeux Tapestry in northern France, connecting with a Hope English alumna in Paris, reconnecting with a dear Swiss friend in the Alps, and participating in a John Donne conference in Lausanne, Switzerland. Whew! She wasn’t the only one in the Alps; Dr. Christiana Salah visited Switzerland in mid-July, but before doing some hiking like Heidi, she made a stop in Vienna, Austria and couldn’t believe who she happened to bump into while catching a train out of the city, boarding the same car, by the same door… our very own Doc Hemenway! 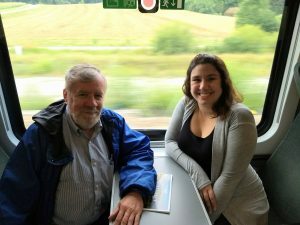 Doc directed and taught both sessions (May and June) of the 62nd annual Hope College Vienna Summer School, which he has led for 43 consecutive summers. Seventy-four students participated this time! After it ended, he visited several of Hope College’s European graduates in Germany and Austria, participated in the San Fermin Running of the Bulls Fiesta in Pamplona, Spain, and attended the week-long 18th International Ernest Hemingway Conference in Paris, France. So that was our summer. How was yours? Let us know in the comments or @HopeEnglishDept, or pay us a visit in Lubbers Hall! Congratulations to all my colleagues. Great job, Christiana.